Landscape photographers seem to have a penchant for hard to reach out of the way places. Yes, we tend to seek beauty in the landscape, but there is also the quest to find the unusual. Places like Dead Vlei in Namibia are not so much beautiful as astounding. They defy our usual imagination of the world. The much photographed Yosemite Valley is alluring, not only because it is beautiful, but because it is otherworldly. Like the hanging cliffs of Vietnam, it looks more like something out of the imagination of a science fiction novel. Of course we tend to forget that Science Fiction is very grounded in what we experience and have in our own world, just on a imaginatively grander scale. When that grander scale turns out to be real, well it just floors the landscape photographer. As a finale to this year’s Romancing The Trees workshop in Tuli Block, myself and the group of photographers who had joined, decided to visit one of these surreal spots that seem more like science fiction than reality: Kubu Island. Possibly better known now thanks to a tenth season special episode of BBC’s Top Gear. Kubu Island really is surreal. Situated at the western edge of Soa Pan, it is basically a prehistoric rocky mound of granite. 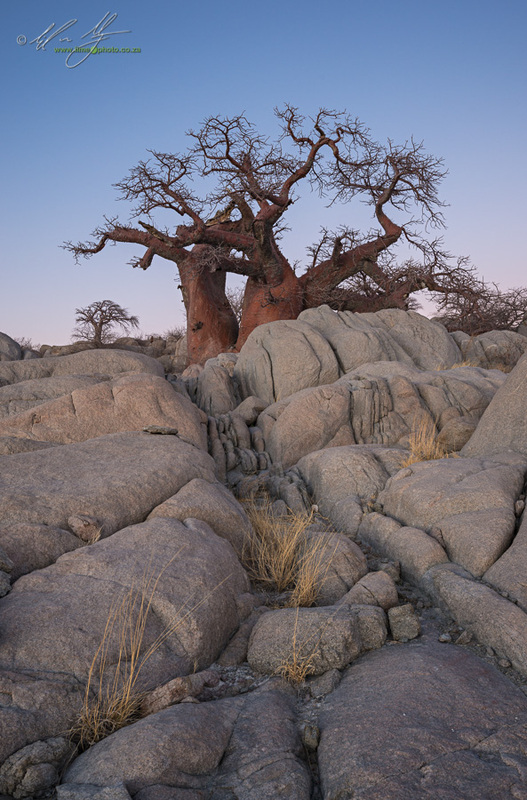 What sets it apart from any other small rocky outcrops, is the fact that it is covered in baobab trees. The surrounding Soa Pan, a flat expanse of dried mud that stretches as far as the eye can see, further adds to the surreal qualities of this unique place. Soa Pan is part of the greater Makgadigadi pan complex, which would have formed the basis for the Makgadigadi lake millennia ago. Kubu Island, with it’s fossilised bird guano was clearly once an island on the edge of this enormous lake system. Now, however, the Pans only fill with a thin layer of water once a year (sometimes skipping a year or two during extended droughts), and the baobabs watch over the immense flatness that is Soa Pan. Stepping over the rocks of Kubu Island feels like you are traveling back in time somehow. No doubt this is inspired by the vast trees, some of which are more than likely well over a 1000 years old. There is a sense of time paused on the eastern side of the island that faces the pan. Of course the sense of timelessness does disappear somewhat on the western side of the island which is where the campsites are situated for visitors. For the most part though, we had a surprising amount of time alone on the island as we worked on compositions of the trees. It is a small island though, meaning that you are likely to have tourists wander into frame during the best light. There are several stands of baobabs that are particularly popular amongst visitors. They happen to coincide with being the tree stands that are also the most photogenic. For the most part though, ordinary tourists tend to drift in and out quite quickly, meaning that unless someone parks a vehicle in frame, you can usually work around other visitors (I say usually as there are groups that seem to have zero consideration for photographers - just breathe, they have as much right to be there as you do). The thing about Kubu Island is that other than photographers, most people don’t want to spend more than a night there. They come, they see, they go. There is very little apart from a few long drops at the designated campsites (a new campsite office is currently being constructed). You have to carry literally everything you need in with you. The nearest village is Mmatshumo to the south. This is 45km away on a sandy track that is east to stuck in. Do not attempt to reach the island without a four wheel drive! As it is, one shouldn’t even consider reaching the island at all from Mmatshumo in the wet season (there is apparently a dry route, but even this can become a muddy quagmire in the wet season). For photographers though, Kubu Island is extraordinary! We spent two nights and wished we had another two. 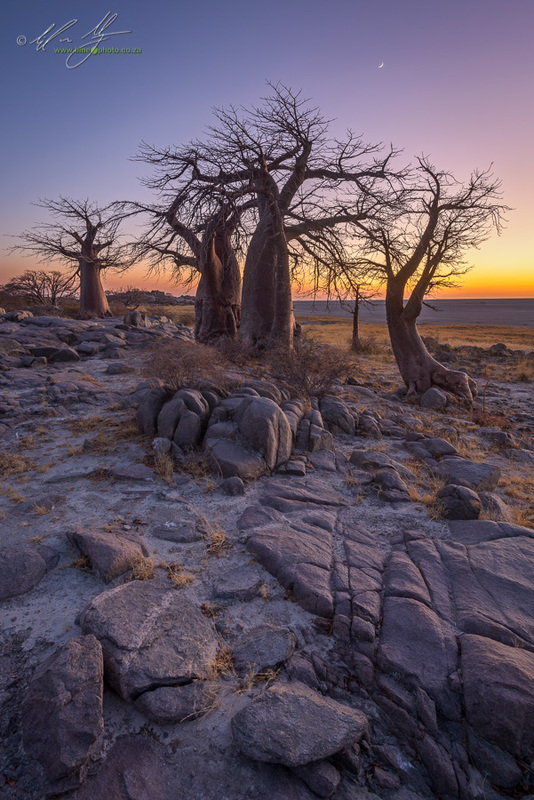 The majestic baobabs stand like ancient sentinels on the grey granite mounds of the island. Personally it is the only place I have visited where these gnarled arboreal giants stand in such close proximity; like spinneys of trees. They are truly awe-inspiring, and more so at night. We had the privilege to spend two evenings photographing the Milky Way over the baobabs, the second time round playing with a panoramic of the full stretch of the ribbon of stars.